Back in 2016, The Guardian published a piece about The Chilcott Report and how Britain should be more careful over civilian deaths in the battlegrounds of the Mid-East. “Future British governments must make a greater effort to assess the number of civilians being killed and injured during their military operations, the Chilcot report says, after the Iraq war inquiry’s series of damning conclusions about the loss of life following the 2003 invasion.” Clearly, the government didn’t listen and the mainstream media do not think it important enough to report on today. Interestingly, Sir John Chilcot believed as late as 2016 that about 150,000 Iraqis were killed during the invasion and subsequent instability. The figure was in fact well over one million. This much was known years earlier. Chilcott, covering for his friend Tony Blair did not read the mounting evidence – or more likely, just ignored it. The 2006 Lancet survey calculated fatalities at well over 650,000 just three years into the conflict and the 2007 ORB survey that actually surveyed fifteen of the eighteen governorates within Iraq found that number was somewhere between 1,033,000 and a staggering 1,220,588. Since then, the violence created by the vacuum has continued and many more civilians have died. The numbers above do not include deaths after 13 years of sanctions imposed by the UN. Many members of the general public in Britain might mistakenly think that the bombing has stopped in Iraq and Syria – but they would be wrong. In fact, in the last four years, Britain has spent over £300 million on weapons fired from its air forces, including drones. The cost does not include personnel, wages, equipment, maintenance, fuel, air bases, etc. Analysis of data conducted by human rights group Reprieve in 2014 concluded that of 41 men targeted by coalition drone strikes a further 1,147 innocent civilians were killed simply for being in the way. Do you remember when George Osborne as Chancellor of the Exchequer in 2015 said that “the cost of extending airstrikes against Islamic State into Syria would run in the low tens of millions of pounds.” Well, it ended up in the high hundreds of millions when adding the total cost – any many people have died as a result. Drone Wars UK demonstrates Britain’s continued bombing activities in the Mid-East with statistics covering the period 2014-2018. 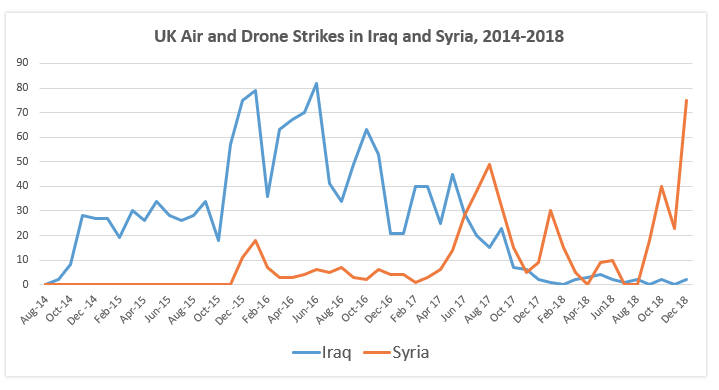 By Chris Cole – DroneWarsUK: The rise in UK air and drone strikes in Syria since September 2018 has been laid bare in the MoD’s latest responses to a Drone Wars UK FoI request. The number of British strikes in Syria per month rose to its highest ever amount (75) in December 2018. Overall, the UK launched 244 air and drone strikes in Iraq and Syria during 2018, firing 512 munitions. Between 2014 and the end of 2018, the UK has fired more than 4,100 missiles and bombs in a total of 1,925 strikes against ISIS in Iraq and Syria. You can see the details on our stats page here. 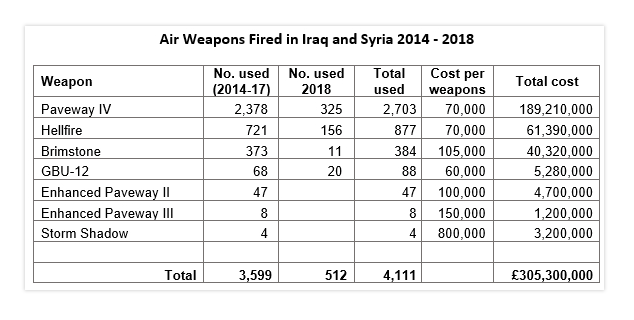 In 2018, for the first time, more UK weapons were fired in Syria than in Iraq – in fact almost 10 times more (464 in Syria, 48 in Iraq). While UK aircraft continue to fly in Iraq, 90% of UK missions occurred in Syria. 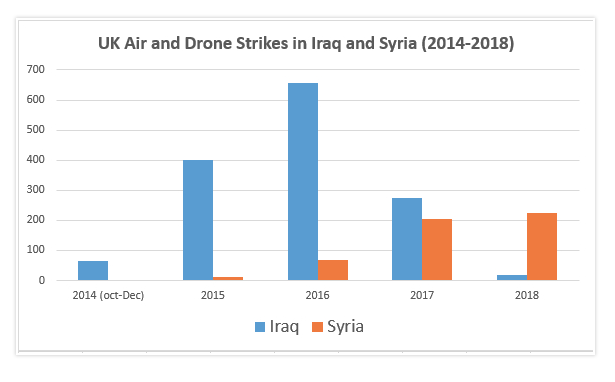 UK Reaper drones continued to operate in both Iraq and Syria during 2018, however, there were no UK drone strikes in Iraq. 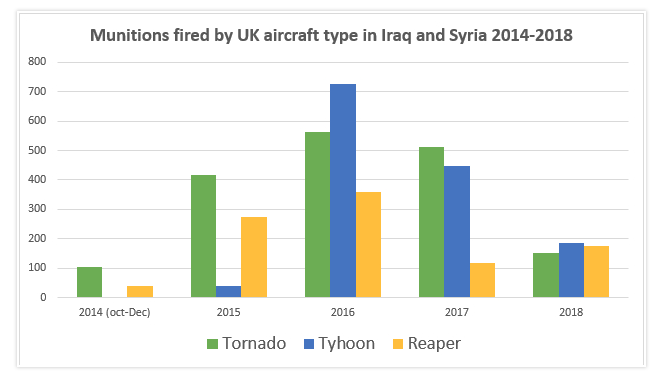 While the MoD continues to insist that its drones are primarily for intelligence and surveillance operations, Reapers fired more weapons in 2018 than the UK’s dedicated strike aircraft, the Tornado, and almost as many as Typhoons. 27% of UK strikes were carried out by drones during 2018. Overall, a quarter of all British air strikes against ISIS have been carried out by drones. Although ISIS has been virtually defeated as a military force in Iraq and Syria, with its territory reduced to a few square miles in the Euphrates Valley (indeed this weekend the final battle is reported to have begun) UK Ministers and defence officials insists that UK strikes will continue until the group is absolutely and totally defeated. Other nations are withdrawing their forces and senior UK commanders acknowledge that ISIS is no longer a credible military force. While the UK’s Tornado’s have been withdrawn, UK drones and Typhoons will continue to launch strikes. In the case of British Reaper drones, that’s approaching 12 years of continuously launching strikes.